Today we had a great DTM seminar by Rachel Osten from the Space Telescope Science Institute (STScI). She talked about stellar activity and coronal mass ejections (CMEs). A coronal mass ejection in time-lapse imagery obtained with the LASCO instrument. The Sun (center) is obscured by the coronagraph’s mask. Osten pointed out that these huge eruptions from stars are important for several reasons. For example, the energy and frequency of CMEs depend on several properties of stars, including their age, rotation rates, and magnetic fields. In general, as stars age, their rotation rates drop, usually reducing the strength of their magnetic fields and the amount of CME activity. And so learning about CMEs can tell us about stellar evolution. When a star fires off a CME, it typically flares or brightens a bit (see figure at right), and since we can’t see stars other than our Sun up close, we can use the temporary brightening of those stars to study their flare activity. Osten talked about one of her projects to use data from the Hubble Space Telescope to look for flare activity for many stars near the constellation Sagittarius. That project had a surprising result: many stars that were thought to be older than the Sun actually showed MORE flare activity than they should have. This result might mean these stars actually have previously unknown binary companions that kept the stars spinning quickly and thereby keeping their flare activity up. Stellar flares may also be important for planetary habitability. For example, a big stellar flare can actually disrupt the atmosphere of an Earth-like planet, perhaps even removing all of the life-protecting ozone. 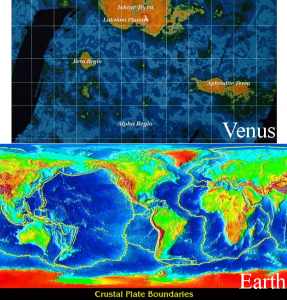 Comparison of Venus’ and Earth’s topography. For Venus, orange represents the topographic highs, blue the lows. For the Earth, red represents the highs and blue the lows. Today I saw an interesting talk about Venusian geophysics by Dr. Steve Mackwell. Dr. Mackwell talked about how mountains, volcanoes, craters, and fractures in Venus’ surface allow scientists to infer the tectonic history of Venus. For example, unlike the Moon, there aren’t that many craters on the surface of Venus, which should have accumulated with time as more and more asteroids and comets struck the surface. This lack of craters (along with widespread, large-scale volcanic features) suggest that Venus underwent a tremendous volcanic upheaval about a half billion years ago, during which global volcanic eruptions almost completely re-surfaced the planet. Dr. Mackwell also discussed how his lab experiments in rock mechanics (in which he squeezes and heats rocks to determine their physical properties) have contributed to our understanding of Venus’ history. For example, the flow of heat from Venus’ interior drives its geophysical activity and plays a key role in determining the strength of the rocks underlying the surface topography. Understanding the relationship between internal heat flow and rock strength, however, requires lab experiments such as Dr. Mackwell’s. This is an enlarged image of the region around the Kleinman-Low nebula in the Orion cloud located 1500 light years away, where a massive star may be in the process of forming. 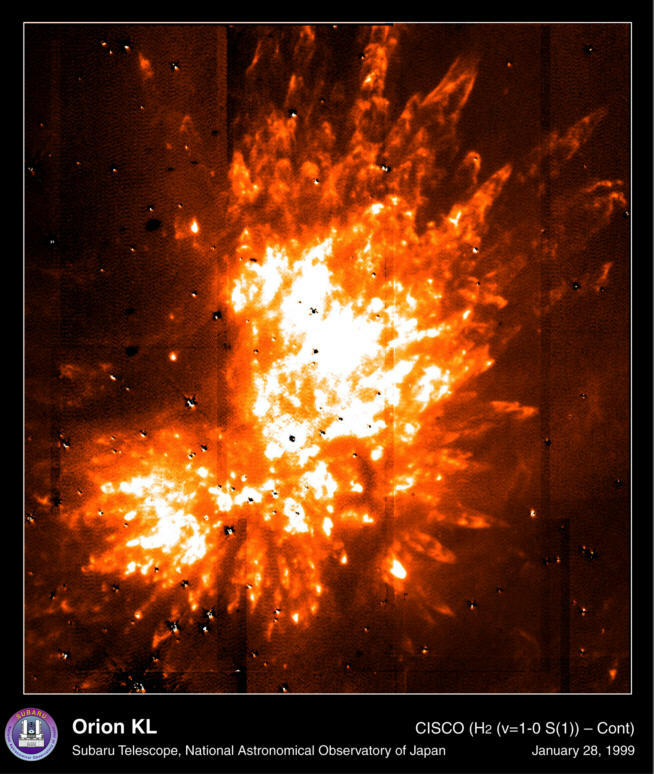 This image was taken in light at 2.12 micron at the Subaru telescope, which is emitted by warm molecular hydrogen gas with an absolute temperature of 2000 K.
I saw an interesting colloquium talk today at the National Radio Astronomy Observatory, given by Prof. Jonathan Tan about formation of massive stars. Many details about the formation process for massive stars remain unclear, and Prof. Tan described that the stars may either form through the merger of many small, low-mass stellar cores or by direct accretion of massive quantities of gas. And big questions about these processes remain. 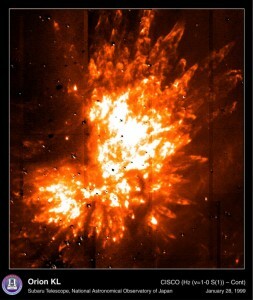 For example, what spurs the initial collapse of a gas cloud into star? How exactly is the mass accreted, and what forces dominate that accretion? How long do all these processes take? Prof. Tan described observations of clumps of gas and dust in the galaxy, including observations from the world’s largest radio telescope, the ALMA array, and how these observations may provide constraints on the star formation processes. 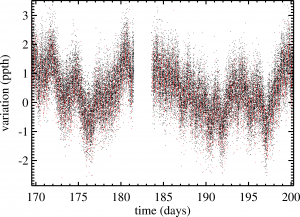 Synthetic data for the new pointing capabilities of Kepler, showing the expected brightness variations for a planet hosting a star that transits (i.e., the planet passes in front of the star, blocking out some of the light). The red points show when the planet is transiting. Recently, the Kepler mission announced that two reaction wheels on the spacecraft have failed, and so the telescope won’t be able to point as accurately as before. As a result, data from the telescope will suffer from large instrumental variations (see figure at right), and so it will be difficult to detect Earth-like planets. However, the telescope may be able to detect other kinds of planets and study other astronomical phenomena. In response to a request from Kepler for new ideas of what to do with the telescope, I wrote about an idea to search for very short-period (less than 1 day) planets. A re-purposed Kepler mission could continue the search for nearly Earth-sized planets in very short-period orbits. Our recent work revealed more than a dozen such planetary candidates, and a more complete and focused survey is likely to reveal more. A new class of exoplanets clock orbits as short as 3 hours. Image Credit: NASA/JPL-Caltech/R. Hurt (SSC). Josh Rodriguez of NASA’s PlanetQuest just sent me a link to a story about our discovery of very short-period planetary candidates using data from the Kepler mission. He somehow did a great job of making me sound very professional. Part of Figure 1 from Follette et al. 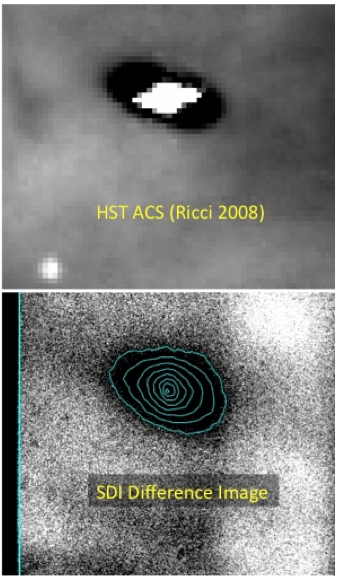 (2013), comparing the Hubble (HST) image (top) to their image (bottom) of the protoplanetary disk. The first one was Follette+ (2013), which presented the first images of a protoplanetary disk taken using a new adaptive optics instrument on the Magellan telescope. This disk (shown at right) is a collection of gas and dust orbiting a young star, only a few million years old. Studying these kinds of young disks help astronomers understand what the early solar system was like, when our planets were still forming. In addition to providing new images of this disk, this paper also presented evidence that, although the disk is young, the accumulation of dust particles that gives rise to planets may already be underway. This result means that, although astronomers have thought this particular disk may show us the very earliest conditions in a protoplanetary disk, instead this disk may be fairly far along in its evolution and the process of planet formation. 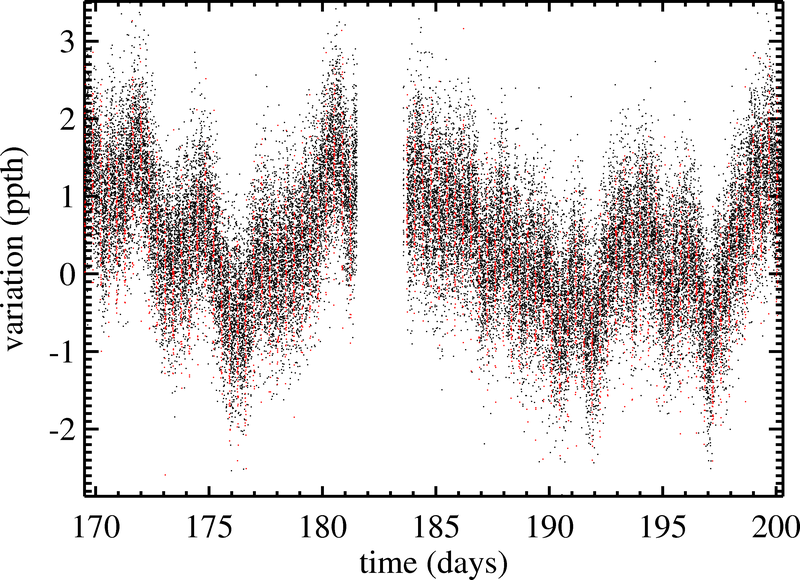 The second paper we discussed was Storch & Lai (2013), which studied the origin of hot Jupiters — gas giant planets (like Jupiter) but orbiting hundreds of times closer to their host stars than the Earth does the Sun. The origins of these planets are still unclear, but they are so close to their stars that they undergo very strong tidal interactions. These tidal interactions distort the shapes of the planets, dissipating orbital energy within the planets’ interiors and causing the orbits to shrink over time. 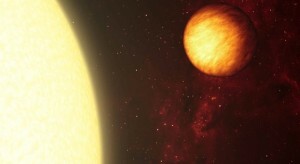 Determining the rates and processes of tidal dissipation are key to understanding the origins and fates of these planets: Too much tidal dissipation will overheat the planets’ interiors and blow them up; too little, and the planets wouldn’t reside in the orbits in which we see them today. Storch & Lai (2013) include the effects of dissipation within the planets’ icy and rocky cores, which they show can help explain the origins of the planets.